The award-winning Argent Motor Lodge in Hamilton is hosting an Easter basket giveaway for this year’s upcoming Easter weekend. The giveaway is set to run as a competition on Facebook and Instagram for a duration of four weeks and will involve entrants liking the Argent Motor Lodge social media pages and tagging friends and/or family members with whom they will share the delicious prize with if they win. Entrants can also score an extra entry if they share the competition post to their own Facebook page or if they repost it on Instagram. 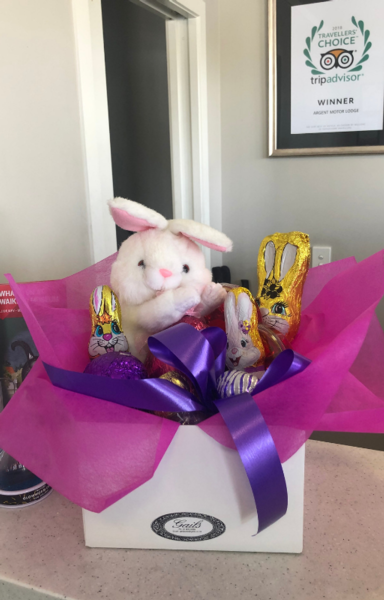 The Easter basket competition winner will be drawn on Wednesday 17th April 2019 at midday. The winner can then collect the prize at any time from the motel, provided that collection is during reception opening hours. Argent Motor Lodge in Hamilton often hosts giveaways on social media sites, Facebook and Instagram as a way of giving back to the community. Previous giveaways have included concert tickets to see Bruno Mars, Valentine’s Day giveaways, tickets to sporting events and much more. Weekend Manager, Rosemary Quay says that it is all about “making someone’s day a little bit brighter” or in the case of this particular giveaway, a little bit sweeter!